View of Piers 2, 3, and 4. Courtesy of the Library of Congress. Historic American Engineering Record, 1946. In 1917, General George W. Goethals entrusted the design and construction of a new army supply base to architect Cass Gilbert and Turner Construction. The resulting concrete building increased the efficiency of material storage, assembly, packaging, and supply, as well as goods shipment at the end of World War I and in subsequent wars. 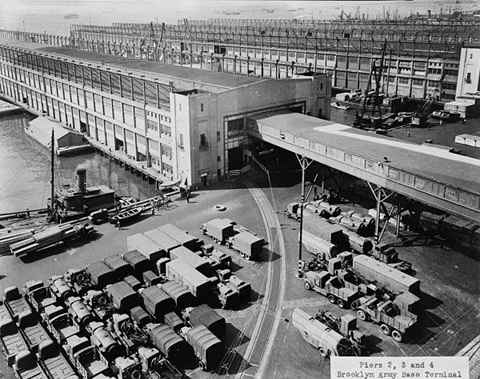 The base is comprised of two huge warehouses-- A and B-- an administration building, boiler house, repair shop, and four piers. At the time, the eight-story Warehouse B was the largest structure ever built in reinforced concrete, providing 52 acres of floor space. Three bridges from the third floor linked the two main warehouses. The larger of the two featured a huge enclosed atrium, and the smaller was joined to the atrium by three covered piers. In order to increase storage efficiency, Gilbert emphasized horizontal and vertical circulation systems: a large crane ran along the atrium skylights, unloading freight from trains running directly into the building; 96 centrally controlled Otis elevators carried up to 10,000 pounds of material at a rate of 150 feet per minute. New York City's Economic Development Corporation is currently leasing spaces for industrial use and providing new amenities.